I received book for review from Handlebar. The opinions within this post are of my own and I was not influenced in any way. Please do your own research before purchasing products or using services. Your opinions and results may differ. The Awakening of HK Derryberry is the inspiring story of how one man was willing to step out of his upper middle-class world into the life of a young, disabled boy with a dismal future. Little did Jim Bradford know the transformational potential of that friendship-for HK and himself. HK Derryberry came into the world with the odds stacked heavily against him. Eventually it becomes apparent that buried beneath HK's severe disabilities is one spectacular ability. He is diagnosed with Highly Superior Autobiographical Memory (HSAM), which involves superlative powers of recollection that enable him to remember everything that has happened to him since the age of three. Less than one hundred people have been diagnosed with HSAM, but none of them have the physical disabilities of HK Derryberry. HK Derryberry is a boy who's a known pickpocket....He steals people's hearts. I may not know him personally, but he definitely stole my heart. 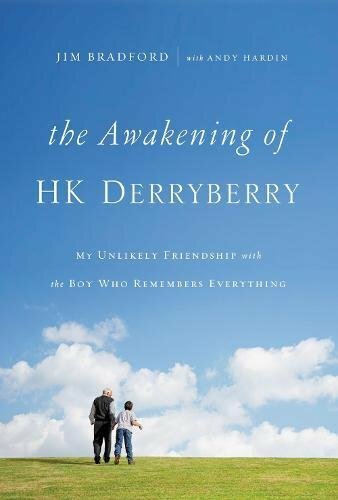 The Awakening of HK Derryberry is a first-person account of Jim Bradford and his forging friendship with HK. Several years ago Jim took an unconventional turn into to a restaurant for coffee, and that day forever changed his life. It was there that he met HK Derryberry, a young boy bent over listening to the boombox. Jim noticed that HK was disabled and learned that the boy spent many hours at the restaurant while his grandma worked. Jim formed a friendship with this child and, throughout the years, became his mentor and best advocate. HK had so many odds stacked against him, yet he flourished once he found a friend who invested time in him. HK is blind and has cerebral palsy, yet has a remarkable memory and a positive attitude. If we were to take the courage and strength of HK and blend it in with the patience and kindness of Jim, this world would be a much better place. HK Derryberry and Jim Bradford now work together as motivational speakers. I'd be thrilled to attend one of their events someday. The book about the two is been amazingly uplifting. Although it chronicles HK's struggles, it's mostly tells of a child with special needs (now an adult) who was given a chance at life and exceeded expectations. This book sounds wonderful. I can't wait to get my hands on it!